Imagine carrying around your very own human blackjack dealer in your pocket or bag. This isn’t an out-there concept anymore – live dealer blackjack titles are being optimised for mobile every day. This means no matter where you are you can whip out your smartphone or tablet and play real money blackjack with all outcomes determined by a human dealer, rather than random number generator software. 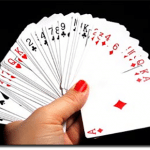 What is real dealer blackjack? When casino games went online, software developers integrated the use of random number software (RNGs). However, the providers and operators found that there was still a gap in the market – many players are somewhat hesitant go online due to their scepticism about RNG software. There are also those who find there is a lack of social atmosphere when playing online, which leaves out yet another part of the market. Therefore, innovative software developers have come up with a solution – live dealer titles where a human dealer is recorded in real time and streamed in HD quality to the player’s screen. Blackjack is one of the most common live dealer titles you will find and here the human dealer not only deals each player a card, but determines and announces the result as it happens. This negates the need for RNG software and even creates a social ambience in your home, and now on-the-go with some software providers creating these titles for Apple and Android portable mobile devices. 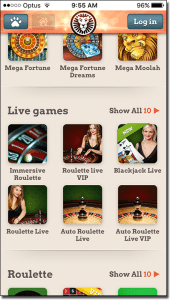 You will notice that live dealer blackjack is available at almost all of our recommended online casinos, but only a few offer a real dealer catalogue on mobile. This is due to the software developers they employ, and whether or not they have devoted time to optimising their live dealer titles for mobile. One software developer which has done this is Evolution Gaming. You will find this software developer at www.Guts.com. Tap on the link via your mobile browser to view the catalogues, with Guts offering a $500 welcome bonus to new Aussie players. Additionally, we’ve chosen Guts for this example thanks to the clear and easy mobile layout – making them one of the best mobile casinos available. Once logged in, you will need to make a real money deposit as you can’t trial live dealer titles (perhaps put down to the fact it is more costly for operators to offer these games). There are a number of mobile-friendly deposit options including Visa, MasterCard, e-Wallets, and prepaid methods to use. Then tap on home and bring up the games list and you will notice a live dealer category link. Tap on this to view the entire mobile live dealer catalogue. Before you get stuck into the game, you will need to disable portrait orientation, and rotate your device. Tap on the live dealer blackjack title available to enter the lobby where you can pick your dealer and table limit from a minimum of $5 and a maximum of $5000 for Evolution Gaming’s Live Dealer Blackjack. You may have to wait for a seat, depending on how full it is and what table limits you have chosen but once there is a spot you will be seated. You will then either be able to make your bets my tapping a chip amount on the table (tap your screen), but if you’ve entered mid-game you will have to wait your turn – as you would at a land-based casino. 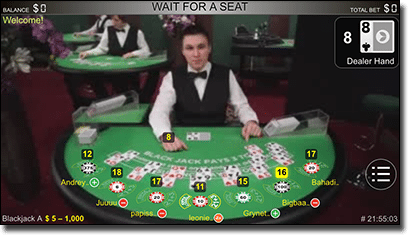 Once you’ve made your bets the human dealer streamed to your screen will deal you, the other players seated at the table, and themselves, two cards – with one of theirs facing upwards. This upcard will be displayed clearly in the top right hand corner, so you can make a play using the basic strategy easily. You’re cards will be revealed and you can indicate if you want to Hit, Stand, or Double, by tapping the options on the screen. The dealer’s other card will be revealed and the croupier will either deal you a card, or not if you plan to Stand, and you will then have to wait for the other players to be dealt a third card if they have chosen to act on their hand. Once all bets and cards have concluded, the dealer will announce the winners and pay out each player accordingly – just like real life 21. You can tap the menu icon at any time during the game and then on the chat icon to chat to the dealer, who will talk back to the text you write. You can also return to the games lobby at any time by tapping on the menu panel. Mobile titles have both their advantages and disadvantages, but we have to say we find the concept of live dealer titles quite interesting. You can literally take your own real dealer in your pocket, and play anywhere you have an Internet or mobile data (3G or 4G) connection. While you may be in a public place, you can simply attach headphones and play on the commute to work. One drawback is since smartphones and tablets are generally smaller than desktop devices, it does limit your viewing screen. Since live dealer titles rely so heavily on what is being streamed to you, this can be a deal breaker for some. 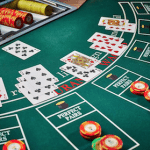 When it comes to the software developer, Evolution Gaming is one of the best live dealer software providers available and they have executed their live blackjack title excellently. We are quite impressed with the fact there are so many tables with varying table limits available. It can get quite frustrating if you accidentally tap somewhere on your screen as an arrow will appear for you to drag the game back into sight – this is to keep the toolbars out of the way but when playing on an iPhone we found we kept tapping the wrong area and had to keep sliding the screen up. To combat this, though, we simply added the mobile casino to our homescreen via our browser’s settings and this removed the toolbars and the need to swipe up all the time. Overall, live dealer blackjack is fun to play on your smartphone or tablet – though tablets with bigger screens would probably be more ideal – and we recommend trying Evolution Gaming’s title out for yourself via your mobile browser (Chrome, Safari, and Firefox are all compatible).